1. 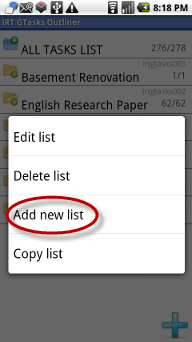 On Tasks Lists View, create a list by using Add List on Menu and enter List name. 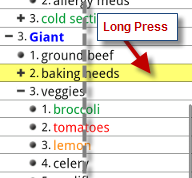 You can also add a list by doing a Long press on Any List and select Add new list. 1. Tap on the list to go to Tasks List Tree View. 2. 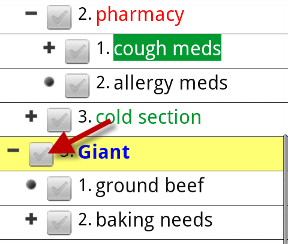 On Tasks List Tree View, add new tasks using the Plus Sign on lower right corner. Enter task name, Save. Note that new tasks are created on top of the list. 3. Create at least 4 tasks. 1. On top of view (1), swipe left/right for font size change. 2. On middle of view (2), swipe left/right for single level expansion/collapse of tasks. 3. On bottom of view (3), swipe left/right for All Level expansion/collpase of tasks. 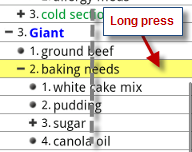 Right Long press - context menu: Edit, Delete, Add, Cut branch, Paste branch, etc. Right Double tap - Show/Hide Drag and drop feature with move panel. 1. Edit a task by doing right single tap on the task. 2. Check off a task by doing left double tap to show checkboxes. Hide checkbox by left double tap again. Right double tap on any task to show the drag and drop icon and move panel. 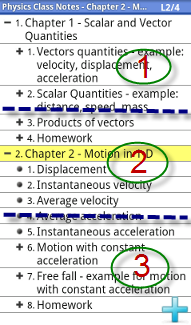 Drag and drop to move up and down the tasks. To promote or demote, right single tap on the task. Use the right or left arrow on the move panel. Right double tap to hide drag and drop features. 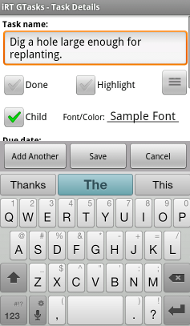 Left tap on the parent task to hide or show children tasks. To delete a task, Right long press on a task, Delete. To delete a branch, Right long press on a task, Delete branch. 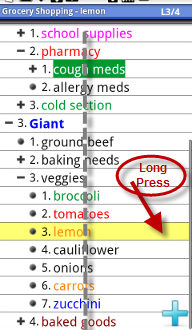 To add a sibling task next to a non-parent task: For example, add celery next to lemon, Right long press on lemon, Add celery as shown below. 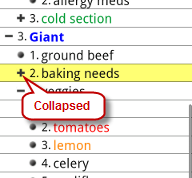 To add a sibling next to a parent task: For example, add drinks next to baking needs, collapse baking needs by Left single tap, then Right Long press, Add. 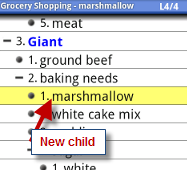 To add a child to a parent task: For example, add marshmallow under baking needs. Expand the task by Left single tap, then Right Long press, Add, enter task name, Save. 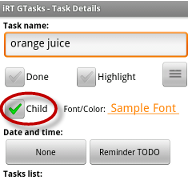 To add a child to a non-parent sibling task: For example, add orange juice under drinks, Right long press, Add, enter task name, Check Child, Save. 1. Tap Menu on Task List view or Task List Tree view or Task views. 2. Tap on More -> Preferences -> Account Manager -> Add Account. Enter email address and password. Login. 3. Go back to Task List View. Menu -> Sync All. Notice the sync progress on the header/top of view. If you have task lists on your Google account, they should show up on the Task List view after sync. 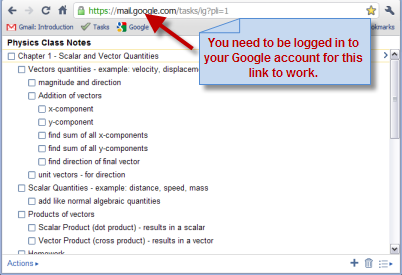 On your PC browser, login to your Google account and access Google Tasks. There are 3 ways to access Google Tasks. 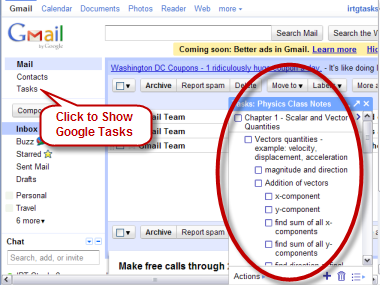 Gmail - click on Tasks on the left navigation bar - the task view will pop-up on lower right. Full screen Google Task on https://mail.google.com/tasks/ig?pli=1 . 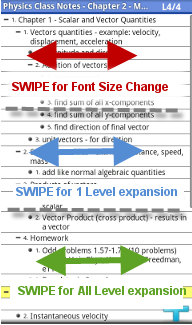 This is useful if you are doing complex outlining of tasks. On Search, tapping on the task displayed while on active search, will go to the task tree, highlighting the task allows you to do regular edits on the task. Tapping on the search icon will go to the Search View which allows you to: edit, checkbox, double tap to go to the Task Tree View. Only one offline account is supported but with unlimited tasks lists. Can be set Visible or Invisible. 1. Unlimited number of accounts. Can be set to Auto-Sync ON/OFF or Visible/Invisible. 2. Drag and Drop to arrange accounts. 3. Tap on Add Account button to ADD a new account. May enter notes on Note box. Tap on Login button to validate account and create the account on your phone. Delete means it will delete the account with its lists and tasks on the PHONE only. It will still be available on Google web. If you want to restore the account after deletion, just add it back and sync. When checked it will show the invisible accounts and list - to make an account invisble, go to Menu -> More -> Preferences -> Account Manager (tap on account to edit) -> Visible (uncheck). 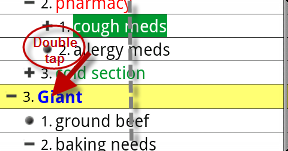 If the account is visible: To make any tasks list invisible, edit the list and uncheck visible. 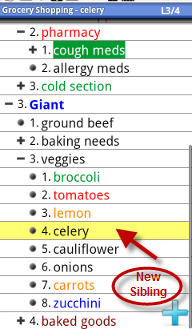 Sort by Name - sorts the tasks by name. 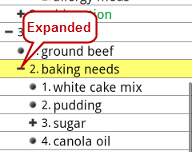 Sort by Account - sorts the list by Account, then by Name. Sort by Last modified date - with the last modified on top (descending order). 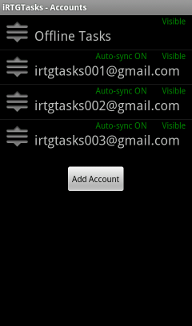 Green - on account means the account is enabled; on Auto-sync ON means it will sync; on Visible means it will show on the Tasks List Home view. Yellow - on Auto-sync ON means it will only sync if account is enabled; on Visible means it will show on the Tasks List Home view if account is enabled. Red - on account means the account is disabled; on Auto-sync OFF means it will NOT sync; on Invisible means it will NOT show on the Tasks List Home view. This is the same edit on Tasks List Home view Right Long Press and ALL TASKS LIST Tree View, right single tap. Auto-sync - check to allow auto-sync but depending if account is enabled/disabled. Default is checked. Visible - check to allow on the Tasks List Home view if account is enabled. Default is checked. 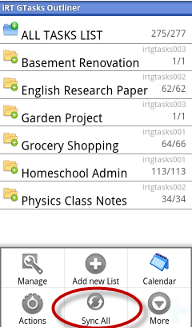 Task notes - check will allow the notes to appear on Tasks Tree view. Default is checked. Note: If you uncheck this, a note icon will appear next to a task. 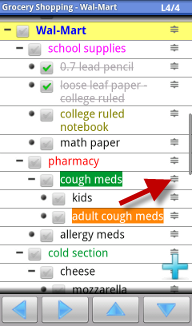 If you want to show the note on a specific task, edit the task and check "Show note always." Task Dates - check to show due dates on tasks. Default is checked. 1. 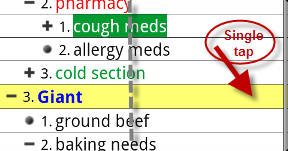 Edit list - to edit the list. Offline account - will be deleted and cannot be restored. Online account - will be deleted and cannot be restored if not on Google account; will be marked as deleted (not visible on the phone) and will be deleted on Google account on next sync. If you delete the list and sync has not occured (auto or manual) and you change you rmind, modify any task on the list on Google Tasks on the web to restore it back on next sync. 4. Copy list - select an account to copy list - copied list will be prefixed with "Copy of". 1. 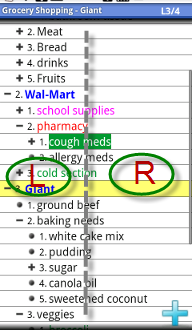 Edit list, Delete list, Add new list, and Copy list are the same as above. 2. New task - to add a Child task on the list. 3. 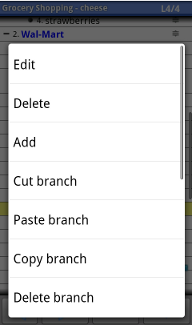 Paste branch - to paste a cut or copied branch or task. Note - enter note here. If the task to be deleted is not on Google web, it will go to the Recycle Bin view on Tasks Tree View -> Menu -> Views -> Recycle bin (scroll down the views list). Right tap on it to restore to top of list. 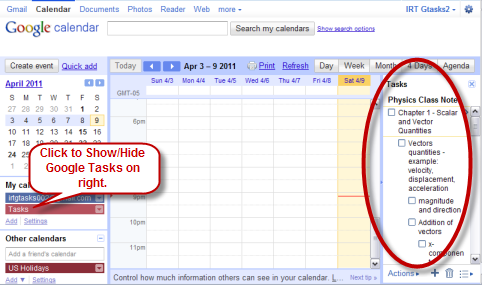 If task to be deleted is on Google web, it will go to the Deleted view on Tasks Tree View -> Menu -> Views -> Deleted. Right tap on it to restore. 3. Add - to add a task as sibling or child. Refer to Basic Use. 4. Cut branch - will mark the task as cut with red background color. To unmark, long press on the task and select Cut branch. 5. 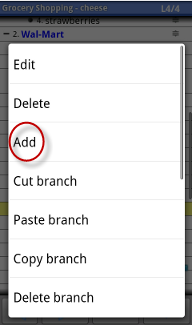 Paste branch - will paste the tasks marked for cut branch on copy branch under a target task. If target task is a parent and collapsed, it will paste next to the parent as a sibling branch. 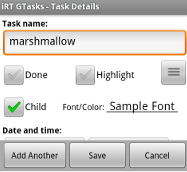 If target task is a parent and expanded, it will paste as a child branch on the task. To cross copy tasks on lists, use ALL TASKS LIST Tree view. 6. 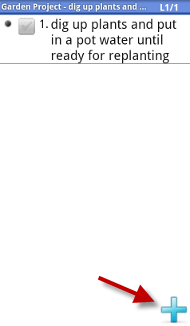 Copy branch - will mark the task as copy with blue background color. To unmark, long press on the task and select Copy branch. 2. Multi-Edit - to show the Multi-edit panel. Sel means multi-select is active. Right Single tap on task to select and unselect. Tap on other tasks for more selection. The Cut, Copy, and Del buttons are enabled to complete action. 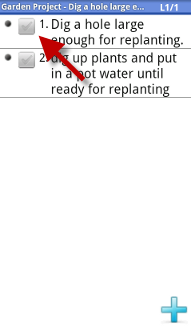 Tap on Cut to mark the selected tasks red, tap on target task to mark as green. Tap on Paste to paste the selected tasks. 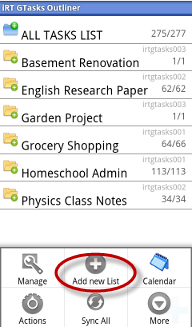 If you select Copy, the tasks will be marked blue, tap on target task marked as green. Tap on Paste to paste selected tasks. Selected tasks will remain marked blue ready for another paste action. To clear, tap Clr. If you select Delete, it will delete the tasks. Tap on Sel to turn it off. 3. Move - to show the move panel with drag and drop icon. To make Move panel independent with Drag and drop action, go to Menu -> More -> Preferences -> Navigation Preferences -> Panel onDragNDrop (uncheck).